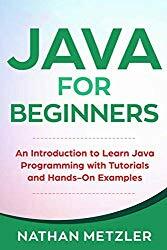 Become Adept At Java With This Concise Guide To The Most Versatile Programming Language On The Planet.With hundreds of programming languages available for new programmers to learn, it is no wonder beginners become stymied when picking a language to adopt as their first. Most end up learning languages that are currently "hot" and are simpler to learn, but the problem is a programming language that is hot today often become looked down on a few years down the road. It's almost like fashion trends, but this problem doesn't apply to the Java language.Invented in 1995, Java is the only language that has stood the test of time and remained extremely relevant in the ever-changing landscape of software and app development. There is only one problem though.Learning to code in any programming language is a challenging endeavor. With an object-oriented programming language like Java, it can become outright intimidating when you fully grasp the sheer scope of the language often scares off a lot of people who are interested in programming pushing them to other "simpler" languages. This is the problem Nathan Metzler set out to solve.Designed for absolute beginners, Java For Beginners is a powerful primer to the world's most adaptable language. It explains complex programming ideas in a simple and easy-to-understand manner, allowing you to acquaint yourself with the program very quickly.Ready to begin your journey to become a Java pro? Click the button to buy now!